Marta Mestrovic Deyrup is professor and catalog coordinator/subject selector for modern languages, classical languages, and Russian and East European studies at University Libraries, Seton Hall University. Deyrup, Marta. 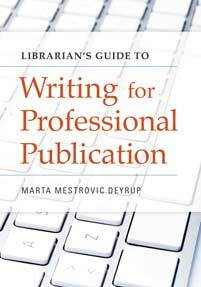 Librarian's Guide to Writing for Professional Publication. Libraries Unlimited, 2018. ABC-CLIO, publisher.abc-clio.com/9781440837692. Professional publication can take your career to the next level. Use this guide to learn the best ways to share your expertise and show commitment to the profession through publishing. • Helps librarians meet the challenge of "publish or perish"